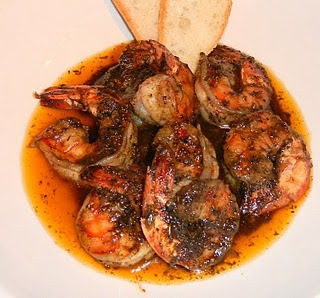 This recipe is a true, bonafide South Louisiana Bar-B-Q Shrimp dish that is made entirely in the oven. If you can find shrimp in your area with the heads on, do so. It really adds to the flavor of the dish. If not, just make sure you cook the shrimp with the shells on....do not peel them first! Also, some recipes call for lemon slices to be added but I find it makes the sauce bitter so, just juice the lemon and discard the rest. Melt butter in large casserole dish and add all ingredients except lemon. Cut lemon in half and squeeze the juice, add to mixture. Bake in oven at 350 until done. Serve in large soup bowls with lots of sauce and toasted french bread for dipping.